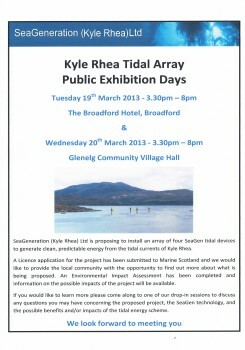 SeaGeneration (Kyle Rhea) Ltd is proposing to install an array of four SeaGen Tidal devices to generate clean, predictable energy from the tidal currents of Kyle Rhea. A Licence application for the project has been submitted to Marine Scotland and the Local Communities can find out more at the exhibitions. An Environmental Impact Assessment has been completed and this information is available also. The exhibitions are another opportunity created by MCT to engage with all involved. They are even planning a special meeting for any worried Local Residents.